WLU honored FSA Network CEO Charles Annett at a WLU Alumni Ceremony in 2014. The Charlie Annett Hospitality Box and the Coach Vince Monseau Wrestling Room were both dedicated on Friday and Saturday, Sept. 11 and 12, respectively. The Annett Hospitality Box offers first class seating in a private club setting for football fans who donate to the Hilltopper Athletic Club. The Monseau Wrestling Room offers coaches, athletes and fans an upgrade in wrestling equipment in a renovated training facility and the promise of a wrestling scholarship. “I am so grateful to the Charlie Annett and the Coach Vince Monseau families for sharing their legacy with us. These two special locations offer huge advantages to our campus community. Students, alumni and visitors will benefit from these gifts for many years to come,” said Vice President of Institutional Advancement Jason Koegler. Alumnus Charles R. Annett grew up in Wheeling, earned a bachelor’s in history and psychology at WLU in 1966, and was a member of the Hilltoppers basketball team. After graduation, he spent three years in the United States Navy (one in Vietnam) and was awarded service medals. He then spent 20 years working in the transportation industry with Ryder Systems. After successive promotions he landed in Miami at the corporate headquarters. In 1989, he was recruited by A&F Transportation Co. and he took advantage of an opportunity to buy the business. He focused the company’s efforts on final mile logistics for major big box retailers like Sears and Home Depot. In 2001, he renamed the company FSA Network Inc. Most recently his company merged to become FSALogistix and added more markets to its network. 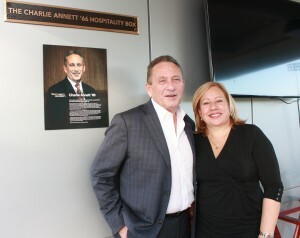 “Charlie’s pledge to our Campaign for a Great University supported the renovation of West Family Stadium and added the hospitality box which will forever serve as an example to the power of philanthropy. The box seating and special features make it one of the classiest examples in college sports at the DII level,” said Athletic Director Aaron Huffman. Annett and his wife Letty live in Weston, Fla. but return to Wheeling often and have family in the area. In fact, five additional members of his family also are WLU alumni. CLICK HERE to read the complete store at WestLiberty.edu.